Glenelg River, Casterton, S-W Victoria, Australia. 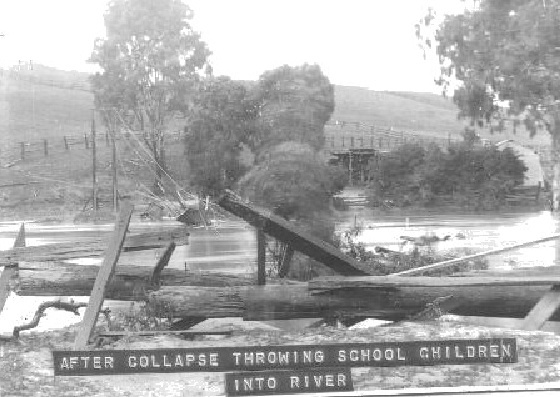 In July 1920 the Suspension Bridge over the Glenelg River at Casterton, S-W Victoria, Australia collapsed throwing schoolboys into the swollen Glenelg River. A passerby rode into the river on his Piebald Horse and helped to rescue the boys. Unfortunately one of the boys, Peter McKenzie, aged approximately 8 years old, drowned, his body was found 3 weeks later in the Glenelg river below "The Bluff" near Sandford, S-W Victoria. (formerly of "Coxon Motors") who was a best friend of Peter McKenzie. Peter Herbert McKENZIE 1912-1920, b. Casterton, S-W Victoria was a son of Robert Herbert McKENZIE 1874-1936, b. Portland, S-W Victoria to Peter McKENZIE and Jane TEMPLE and Clara HUMPHRIES 1884-1969, b. Casterton, S-W Victoria to George HUMPHRIES and Frances Brampton "Fanny" MILLARD.